Beautiful specimen certificate from the Arizona Water Company printed in 1899. 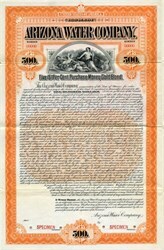 This historic document was printed by the American Banknote Company and has an ornate border around it with a vignette of an allegorical woman and 3 cherubs at waters edge. Arizona Water Company was incorporated in 1898 in Maine. $1,000 General Mortgage Five Percent Income gold Bond. Bond number 440 issued to Orient Insurance. Black print with green border on white paper. The Arizona Water Company managed the Salt River Valley, Grand and Maricopa Canals, and the Arizona Improvement Company.